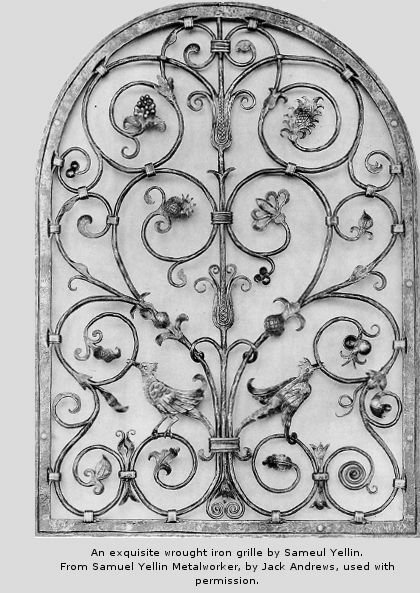 Today the term "wrought ironwork" has come to include just about any kind of metalwork, from gates and grilles, to furniture and hardware, regardless of how or what this metalwork is made. If we take a closer look however, we find that very little of this "wrought ironwork" is actually wrought at all. The word "wrought" means to work, to beat into shape of the metal. 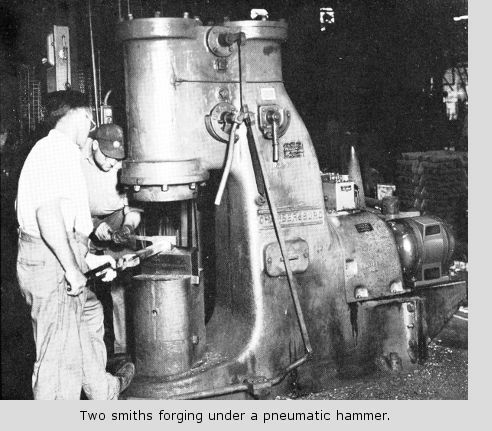 "Forging" is analogous to this term. One who works in wrought iron, who forges iron, is called a blacksmith. Very simply put, a blacksmith heats the iron in a forge and hammers it on an anvil. A blacksmith who makes and fits horseshoes is called a farrier. Blacksmiths may specialize in industrial forgings, tool repair, historical replications, architectural ornament, furniture, lighting, sculpture or any combinations of these. What are the different kinds of ironwork? The most commonly found ironwork today is of the cold bent variety. This is typified by very simple designs, the use of lightweight tubing, plain strip iron, and bar stock. Often these strips and rods are cold twisted or bent into crude scrolls and other generic shapes. Included here also, is the use of pre- manufactured hardware, expanded metal, and ordinary sheet. This type of work is machine made and assembled using modern electric welding techniques. Another well known type of ironwork is cast iron. Decorative cast iron is recognized by its heavy, solid look. Designs are fashioned in sand molds into which the liquid hot metal is poured. This process requires that the design must allow the molten metal to flow easily. Therefore, most of the openness and airiness of "wrought" iron is not possible. Frequently, cast iron and cast aluminum design elements are combined with cold bent ironwork. Most recently, the market has been flooded with a plethora of what I call "silhouette" ironwork. This genre became popular with the advent of the portable plasma arc torch. Designs are drawn on sheets of steel and quickly cut out with this torch creating positive and negative spaces. These sheets are then incorporated into table, chairs, and knick-knacks. "REAL" wrought ironwork on the other hand, is the rare bird in today's market. This is because it is laborious and requires a high degree of skill and stamina to produce. A blacksmith heats the iron bar in an intense fire, then working quickly, manipulates the hot metal on the anvil with a hammer, co-ordinating hand and eye to produce the desired result. Each piece is individual and unique, as no two forgings are exactly alike. This is precisely what gives true wrought ironwork its character, strength, and life. Blacksmithing is centuries old, it is the quintessential form, the one from which all the others have originated. In regard to pricing these types of iron work, it should be recognized that cold bent iron work is the least expensive, as it is production oriented, designed to fulfill the needs of the off-the-shelf buyer. Cast iron runs higher than cold bent because it is more difficult to produce and large quantities must be made before it is profitable. It also is production oriented which in turn denies it uniqueness. Cast iron has it limitations; it may be fine for patio furniture, but one-of-a-kind, site-specific projects are not cost effective for most consumers. The silhouette style of ironwork I have referred to has a very broad price range because it is so new. Some consider it an addition to the craft while others see it as an art form. Pricing generally follows these thoughts. 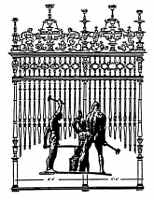 Wrought ironwork made by a blacksmith is often the most expensive genre of iron work, not only because of the physical labor required by the forging process, but also because of its' inherent aesthetic value. This type of work lends itself best to custom made, one-of-a-kind objects which can be commissioned from a blacksmith to suit ones special needs, from the plain and ordinary to the most abstract. For a greater understanding of "wrought" ironwork, I highly recommend reading "Wrought Iron in Architecture" by Gerald K. Geerlings, available from Dover Publications.